(L-R) Mr. Puneet Sethi, Vice President, Consumer Electronics Enterprise Business, Samsung India, Mr. Alok Tandon, Chief Executive Officer, INOX Leisure Limited, Mr. SH Jang, Director Consumer Electronics Enterprise Business, Samsung India. 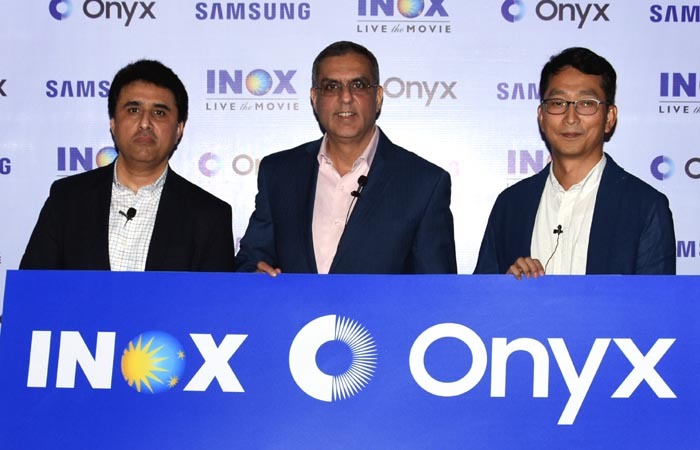 MUMBAI, India – December 05, 2018 – Samsung India, the country’s largest consumer electronics company, and INOX Leisure Ltd, India’s leading multiplex chain, today introduced ‘INOX Onyx’to Mumbai, ushering in the future of cinema to the land of Bollywood. The world’s first Cinema LED offers most powerful, captivating and larger-than-life visuals thus, making the cinema viewing experience as natural as you would watch it in real world. This cinema redefining technology – Onyx – is a game changer in the film exhibition industry and is only DCI compliant LED display. INOX at Malad, Inorbit Mall will play host to Mumbai’s first Cinema LED Theatre. Through this technology, an audience experience is uplifted to a level wherein characters and places come alive and fuel imagination whilst watching a cinema. Through HDR refinement, guests get to enjoy next level experience with more detailed, textured and visually rich content because it is 10 times brighter than conventional projector and also has infinite contrast ratio. Samsung ONYX is unaffected by ambient light, it upholds consistent and distortion-free picture quality that keeps audiences engaged and keeps it close to realism. Not just visually advanced pictures, ONYX Cinema LED technology amplifies next-level cinema content with JBL’s sculpted surround sound audio. “Onyx, another transformational innovation by Samsung, will change the way we watch movies and will mark a new chapter in the history of cinema. The hundred year old projection technology will be a thing of the past. With INOX Onyx, welcome true colours, bring alive the LED Screen with real life like picture quality and exhilarating sound. We are elated to partner with INOX in our endeavour to revolutionize the movie viewing experience in the city of dreams – Mumbai,” said Mr. Puneet Sethi, Vice President, Consumer Electronics Enterprise Business, Samsung India. “One of the advantages of Onyx Cinema LED is that it can uphold exceptional picture quality even at ambient lighting conditions. Making use of that, at INOX ONYX Diner, viewers will also enjoy more elaborated menu while enjoying their favourite movies,” he added. “At INOX, we believe in the philosophy of ‘LIVE the Movie’ and commit the best cinematic experience to our customers. Our association with Samsung to launch World’s first cinema LED technology in Mumbai is a testimony of this commitment to them. Technology and innovation are at the core of INOX and we continue to redefine the cinema viewing experience by combining luxury with technology to present the best experience to our audience” said Alok Tandon, Chief Executive Officer, INOX Leisure Limited. With increasing interest in the technology among movie experts and enthusiasts, Samsung launched the innovative Onyx Cinema LED, a move away from the projection systems that were existing hitherto. The Onyx Cinema LED has the potential to deliver unparalleled picture quality, bringing content to life with greater vibrancy and accuracy.